Most people are uncomfortable with silence. There’s something very awkward about it somehow. As an organist, I love the MIDI component in our organ that allows me to pre-record a song and play it when I go up for communion. Before it was installed, I dreaded those silent two minutes like you wouldn’t believe. I felt like everyone was starting at me, waiting for me to get back on the organ bench. But with quiet music playing in the background, somehow everything seems better. The same philosophy holds true in conversation. We all dread those awkward lapses when no one has anything to say. We try desperately to fill the void with pointless one-liners: “Soooo, nice day out today, huh?” or “Man, I’m tired,” or “Let’s see, what else?…” We just have to say something, anything to avoid silence. But sometimes silence is a good thing. Recently a friend told me devastating news on their end that literally left me speechless. I racked my brain for something to say and came up completely blank. (That’s rare for me, by the way. I’m a writer and I’m supposed to have a way with words, so you know things are desperate when even I can’t think of a response.) After a while I finally realized something important. Sometimes the most powerful way to communicate is to say nothing at all. I’ve been on both the giving and the receiving end of comfort during hard times, and I’ve learned more by being on the receiving end. When we went through a particularly hard time in our lives a few years ago, people tried to be supportive by encouraging my husband and me. This is a kind thing to do, but a lot people said things that weren’t helpful. I’ve learned never ever to start a phrase with, “Well, at least…” Don’t do it, people. Just don’t. If you’re talking to someone who has just received news that their cancer is aggressive and terminal, don’t try to make them feel better by saying, “Well, at least you’ve led a full life so far.” If a friend has just suffered a miscarriage, don’t say, “Well, at least you have other kids. And you’re young- you can try again!” If someone has just lost a job don’t sugarcoat it by saying, “Well, at least you weren’t living paycheck to paycheck!” When talking to someone whose loved one died unexpectedly, don’t say, “Well, at least she’s in a better place.” None of those responses are helpful. At all. Never try to compare someone’s situation with a worse scenario. Even if the things you say may have a nugget of truth in them, grieving people aren’t ready to hear them. It only makes them feel worse, as if they should somehow be thankful that their situation isn’t worse than it is. Avoid as well pat answers and cliches. When our family was going through that hard time, I can’t tell you how many times I heard “This, too, shall pass…” and “God has a plan” and “You just have to trust God in this, Ruth.” Again, none of those things are inaccurate, but now is not the time to say them. They aren’t helpful because someone who is overwhelmed by their circumstances simply isn’t ready to hear them yet. There is a time and place for these phrases, but now is not that time. It made me feel guilty when people said them to me, like my faith was weaker than it should be. And let’s be honest, they are usually said (or at least taken) in a slightly condescending way. “Oh, sweetie, I know your life is at its lowest point right now, but this, too, shall pass. You just need to trust God through it all. You know He has a plan!” It’s salt in a wound. I felt like a kid again, being gently chastised by a parent for my poor response. It simply isn’t helpful. So what should you say to someone who is facing something overwhelming? Here’s a novel thought- don’t say anything. The most powerful response I got when I felt like my world had just been turned upside down was my dear friend who simply hugged me and cried with me. She didn’t say a word. She didn’t have to. Just her presence and support was enough. Try it. Go to a doctor’s appointment with a friend whose diagnosis is grim. Sit with her in the waiting room and hold her hand. Hug your friend who just had a miscarriage. Cry with her. Invite your buddy who just lost his job to go fishing with you. Sit there side by side in supportive silence. Bring a meal to your friend whose loved one just died unexpectedly. Let her vent if she needs to while you listen quietly. The Bible tells us in Ecclesiastes 3:7, “(there is) a time to keep silence, and a time to speak.” That can be a difficult thing to discern. 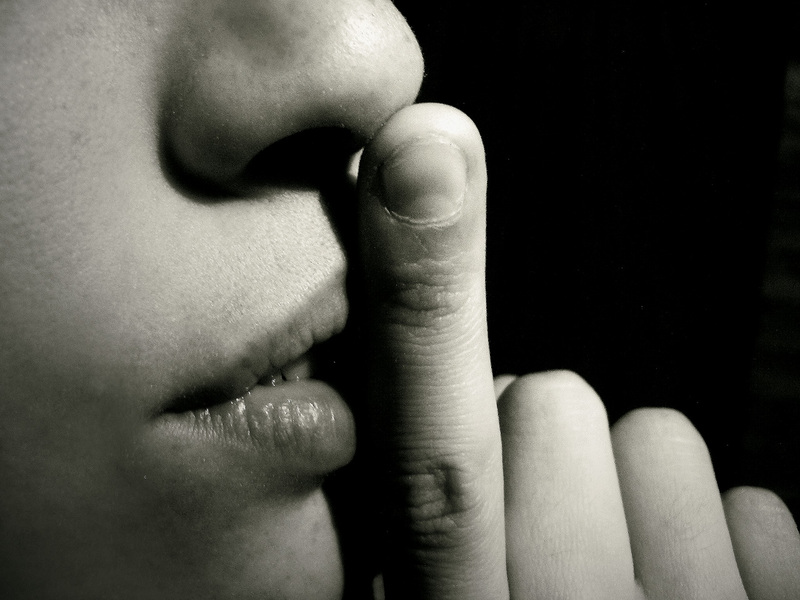 But throughout the Bible there are examples of the power of silence. Habakkuk 2:20 says, “The Lord is in his holy temple; let all the earth keep silence before him.” Zephaniah 1:7 says, “Be silent before the Lord God!” and Zechariah 2:13 tells us, “Be silent, all flesh, before the Lord, for he has roused himself from his holy dwelling.” (Or in the words of one of my favorite hymns, “Let all mortal flesh keep silence, and with fear and trembling stand…”) Even Jesus Himself, who spoke the very words of life, knew when to be silent. At His trial, He remained silent, “As a sheep that before its shearers is silent, so he opened not his mouth” (Isaiah 53:7). And yes, even in social settings Jesus knew when not to speak. Think about the time He went to Bethany after Lazarus had died. When Mary fell at His feet and told Him in anguish that had He been there, Lazarus would not have died, Jesus “was deeply moved in his spirit.” He asked only, “Where have you laid him?” And when they showed Him the tomb, what did Jesus do? He wept. That’s all. He didn’t give some great discourse or use that moment to teach a lesson (although He certainly could have). He showed His support and love by standing with Mary and Martha and crying with them. In a world full of noise, sometimes the most powerful messages are conveyed through silence. Offer your shoulder to cry on instead of offering pious platitudes. It’s enough to know that someone is there for you, and that they care enough to be silent. In today’s always on, always running, always moving, earbud-wearing society, silence is almost extinct. I read somewhere that the average teen experiences about 10 minutes of silence per month! The need to turn something on to fill the silence is overwhelming, and I am guilty of it also. Excellent article (as always) Ruth. That being said, I appreciate you pointing out to me and others that it is okay to sit with someone in silence and just be there for them.